In the middle of the town square, in front of a packed house at City Hall in Wroclaw, Tomasz Adamek and Vitali Klitschko attended the final press conference held prior to their upcoming WBC Championship fight. Michael Brill, General Manager Wroclaw Stadium: "Yesterday we had the first test event at Wroclaw Stadium. It's a beautiful stadium, it's gorgeous. There is no better place in the world I think to hold such an amazing fight. We will have everything fine-tuned for this Saturday. The fight has already sold more than 40,000 tickets; it will be broadcast in more than 120 countries with more than 500 million people watching it. It will change the history of big sporting events in Poland." Tom Loeffler, K2 Promotions: "Tomasz Adamek is so well known in Poland. He's a warrior, he's shown his heart and he is very successful in the heavyweight division. In the last promotion that we did, when Vladimir unified the title against David Haye, the whole time on the K2 and Klitschko side we knew in our hearts that Tomasz was really more of a warrior than Haye. So I think that you'll see a great bout." "Vitali is the type of fighter who just dominates the fight. Not only does he win fights, he wins rounds. We're really looking forward to this fight between these two great warriors for the WBC championship." Kathy Duva, Main Events: "It is really a thrill to be back here in Wroclaw. I watched online, actually every day, and saw the stadium come up from the ground. We went there yesterday and saw it for ourselves. I just cannot wait to see what that place is going to look like and sound like with 42,000 people in there, because it hurt my ears last night when there were 8,000 people there. It's turned into a magnificent facility that people all over the world are going know about next week." "This is the first ever event to be shown on pay per view in Poland. If you have Canal+, Polsat, UPC, TOYA, INEA, or Vectra, you'll be able to see Pay Per View. It'll be 40 PLN, so everybody get together and have a party! It's going to be an great event both in the arena and for everybody watching it on pay per view. Also it will also be shown in some movie theaters around Poland; the Multikino System will be showing it and the tickets are on sale now." Vitali Klitschko: "Wroclaw is a great city. When I flew in I saw a great stadium, all ready, I saw it from the sky and it will be fine. Many have been worried, 'is the stadium going to be ready?' Don't worry, the main thing is the fighters and they are ready, the stadium is also. The preparation is done." "I know Tomasz Adamek is the most difficult fighter. He is very fast, very good condition. This fight will not be easy for me and this is why the preparation was special. Why special? Because I have a special opponent and I have special surprises. The surprises you can see in the ring." "I'm ready to fight Tomasz. Everybody watched the Vladimir - Haye fight. David Haye is the biggest talker; Tomasz Adamek is the strongest fighter. Behind my brother and me is Tomasz. Can Tomasz be #1 in the world? Let's see. I kind of like you Tomasz, maybe after this fight we can be friends, but on Saturday there will be no friendship between us. 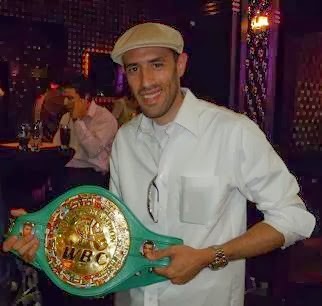 I am very proud have this belt, which many years ago Muhammad Ali, Lenox Lewis and many, many big fighters had and I never ever give this title to someone just for free. Tomasz, good luck trying to take this title away, I am ready to show my skills. This title is my title." Tomasz Adamek: "I'm really glad to be in Wroclaw. I was ten and a half weeks in training. That was a time for preparation, now is a time for the fight. I'm in great shape after training with Roger (Bloodworth). I thank God for those weeks, it's a long time and I was able to stay healthy." "I want to thank all my fans who purchased tickets & everyone that will purchase pay per view. We are showing not only Poland, but over 120 countries that this fight is a really big event." "I'm ready for a big war with Vitali. I'm really ready to win this belt. I know it's not going to be easybecause it's never easy in the ring, but my spirits are high and I'm ready for it. I will do everything to keep the WBC title in Poland." The fight will be shown live, Saturday, September 10, on HBO World Championship Boxing at 4:45pm ET, and will re-air on September 11, 12 and 13, check your local listings.